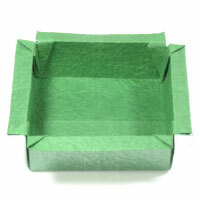 There are all kinds and sizes of origami boxes that you can make from a square paper. 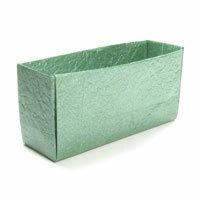 These boxes are not just for watching but you can practically use them for storing something. 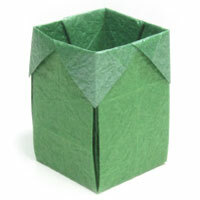 This simple round paper box is fairly easy to fold, not involved with any special folding techniques and it is based on 8x8 matrix base. 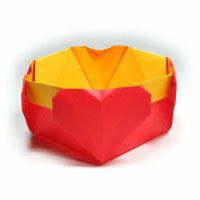 This four-heart origami box is a good box to make on a special event. 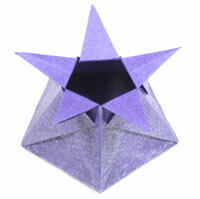 It has a heart symbol on four corners and it is based on 4x4 matrix base. 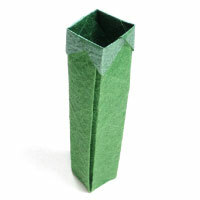 This origami box is taller than a simple roud origami box. it is based on 12x12 matrix base. 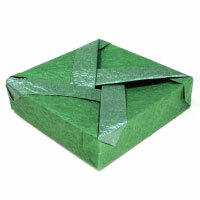 Unlike some similar boxes, you don't have to fold the paper into thirds! One of users thanked me for not making him fold thirds. 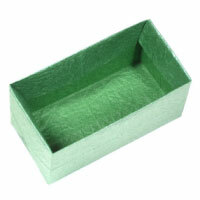 This closed oblong box makes use of 8x8 matrix base. You will need to insert a flap into another flap. This tallest square box makes use of a 4x4 matrix base. You will need to learn to apply inside reverse-fold for this model. 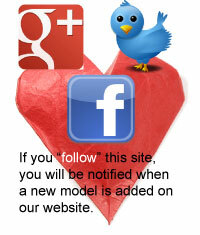 This is a open box model. 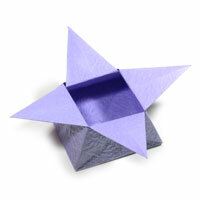 You will need to apply petal-fold to inside of the box four times. 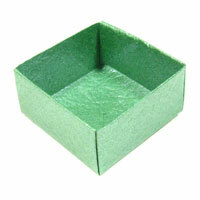 It is a flat square box. 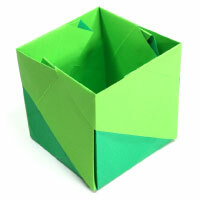 This trash box based on a 8x8 matrix base is an easy model to fold. 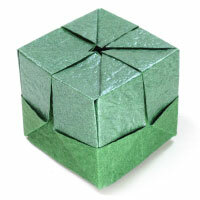 You wil not need to learn any special folding technique to make this model. 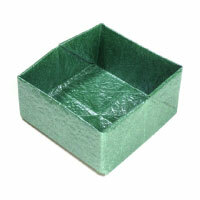 This trash box II based ona 2x2 matrix base is even more easier than the trash box I since its base is more simpler. This box is very unique. 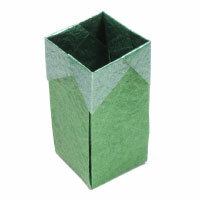 It is a tall box without an opening on the top. This closed tall box II starts from 8x8 matrix base. 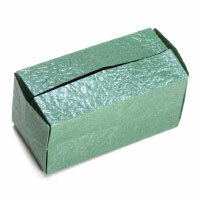 It is a closed box with a simple pattern on the sides. 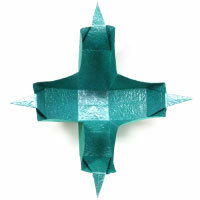 There is no special folding technique involved with this model. This box starts from 8x8 matrix base. 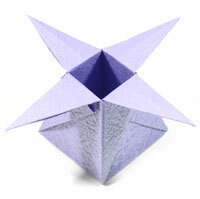 One special folding technique that you need to know for this model is pocket-fold. 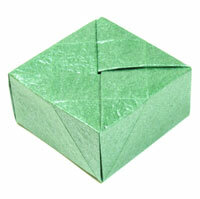 You can fold a rectangular shaped box here. The ratio between the width and the length of the rectangle is 1:2. This means that the area can be made out of two squares. 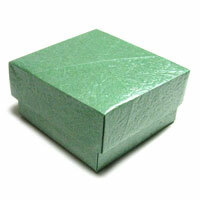 The rectangular shaped box is presented here. The ratio between the width and the length of the rectangle is 1:2. 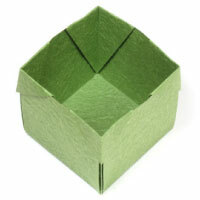 One special folding technique involved with this model is 90 degrees mountain-fold. 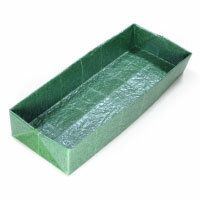 This rectangular shaped box can be opened or closed. It starts with 8x8 matrix base. One special folding technique you could learn from this box is inside reverse-fold. 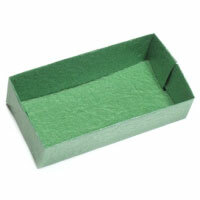 This flat rectangular shaped box starts from 4x4 matrix base. The ratio among the width, the length, and the height of the rectangle is 4:6:1 . 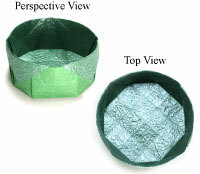 Two special folding techniques involved with this model are both 90 degrees mountain-fold and 90 degrees valley-fold. 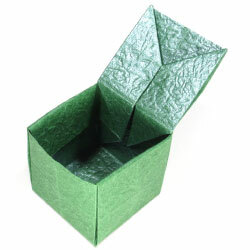 The rectangular shaped box is presented here. The ratio among the width, the length, and the height of the rectangle is 2:4:1 . 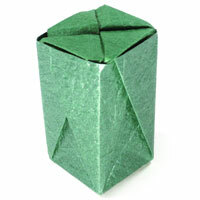 One special folding technique involved with this model is 90 degrees mountain-fold. 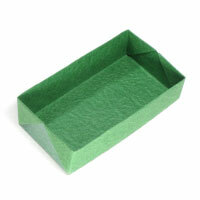 This flat rectangular box II is very easy to fold. The ratio among the width, the length, and the height of the rectangle is 2:4:1 . 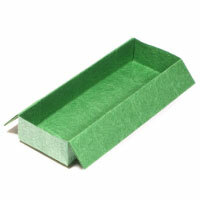 One special folding technique involved with this model is Z-fold. 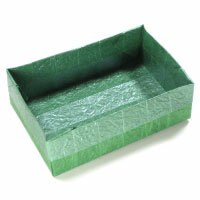 This closed rectangular box starts from a 4x4 matrix box base. One special folding technique you need to learn from this model is a chair-fold. 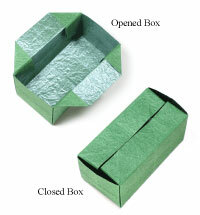 You can fold a rectangular shaped thin closed box here. This box is a small sized box of square. There is no special folding technique invloved with this model. This narrow deep box is a open box. There is no special folding technique involved with this model. 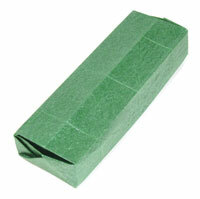 This long rectangular box starts from a 8x8 matrix base. There is no special folding technique involved with this model. 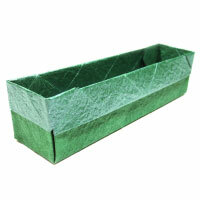 This wide rectangular box starts from a masked 16x16 matrix box. The ratio among height, width, and length of the rectangle is 1:2:3 . One special folding technique involved with this model is inserting a flap into a pocket. 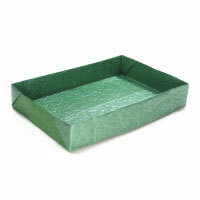 This wide and flat rectangular box starts from a 6x8 matrix base. It is fairly easy to make one. There is no special folding technique involved with this model. This box starts from 3x3 matrix base. Two special folding techniques that you need to learn for this models are both Z-fold and inside reverse-fold. 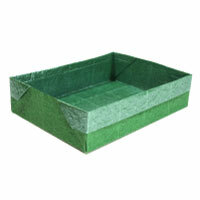 This box has a dimension ratio of length : width : height = 4 : 1 : 1. 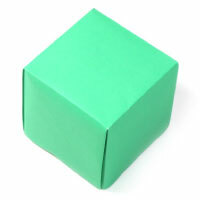 This 4x1x1 box starts from a 8x8 matrix base. You will learn to insert a flap into a pocket from this model. 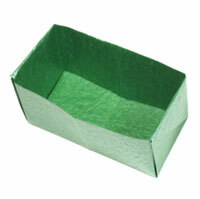 This box is a classical box and it is based on "cushion base". 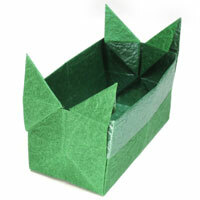 It is very easy to make this box and you can put anything into it. 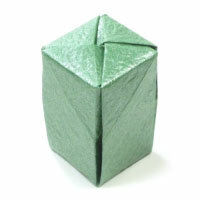 This classical oblong box is similar to easy origami house in the beginning stage of folding sequence. One special folding technique you need to apply is a squah-fold. This box starts from a 4x4 matrix base. There is no special folding technique involved with this model. 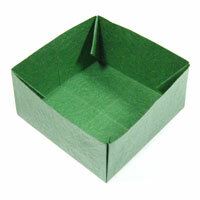 This box is easy to fold. The height of this box is exactly half of square width. So it is flatter than a cubic box. 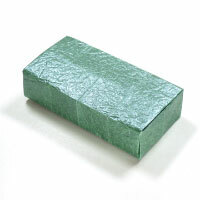 A maximum volume for a box of square can be made when square width is 2/3 where the volume is 2/27 = 0.074. 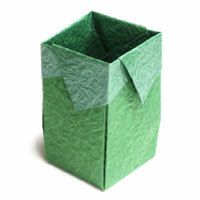 Since the square width for this box is 1/2 and the volume is 0.0625, it generates a reasonable volume size. 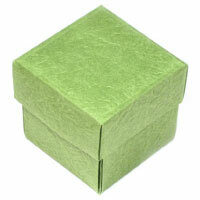 This cover is for the large square origami paper box. You can use the same size of paper for this cover. 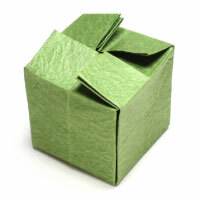 This closed rectangular box starts from a 4 x 4 matrix box. The ratio among width, height, and length of the rectangle is 1:1:2 . One special folding technique involved with this model is inserting a flap into a pocket. This box is very unique. If you need a box with no opening, this is the one for you. 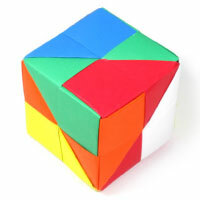 This box starts from 4x4 matrix base. One special folding technique that you need to know for this model is rabbit ear-fold. This box starts from 4x4 matrix base. 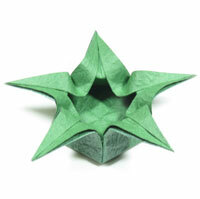 One special folding technique that you need to know for this model is squash-fold. 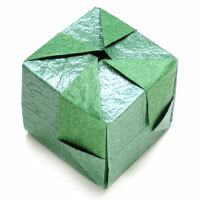 This classical origami cube can be made by putting six modules together. 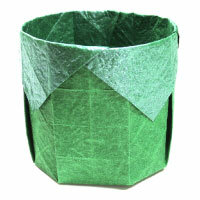 Here I used six typical origami paper with different color. 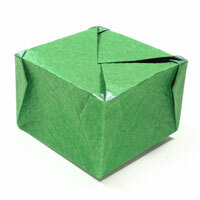 You will need two pieces of paper to make this origami cube. 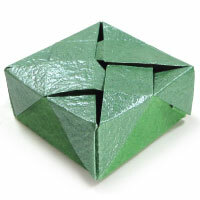 There is no special folding technique involved in this model. 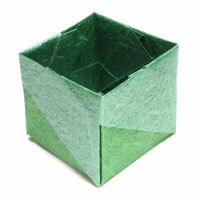 You will only need a single paper to make this simple origami cube. 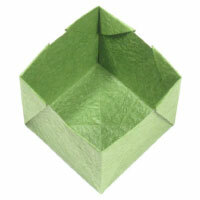 This origami open cube is a cube without the top so that you can put something in it. 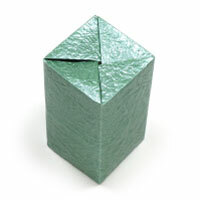 This origami open cube II is a variation of origami open cube. 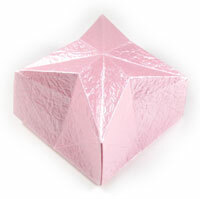 You can make this closed origami cube with a various size by varying Δ which is shown in the instruction. 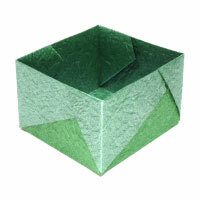 This closed origami cube starts from a 8x8 matrix base. There is no special folding technique involved with this model. 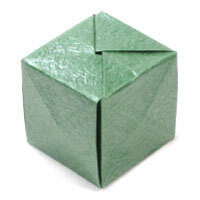 This closable origami cube starts from a 8x8 matrix base. 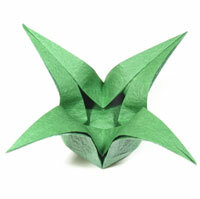 One special folding technique involved with this model is petal-fold. 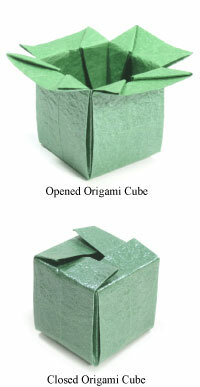 This open origami cube III is different from other open origami cubes. 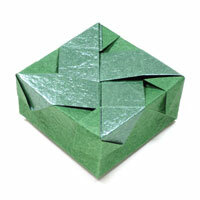 This open origami cube with pattern starts from 4x4 matrix base. 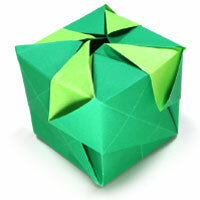 There is no special folding technique involved with this model. 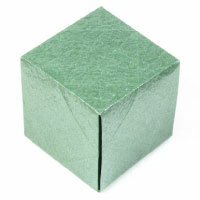 This closed origami cube starts from a 8x8 matrix base. 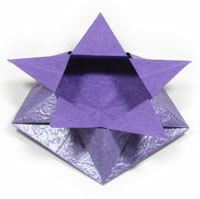 One special folding technique that you will learn from this model is inside reverse-fold.